Neisha Woo is a fast worker. 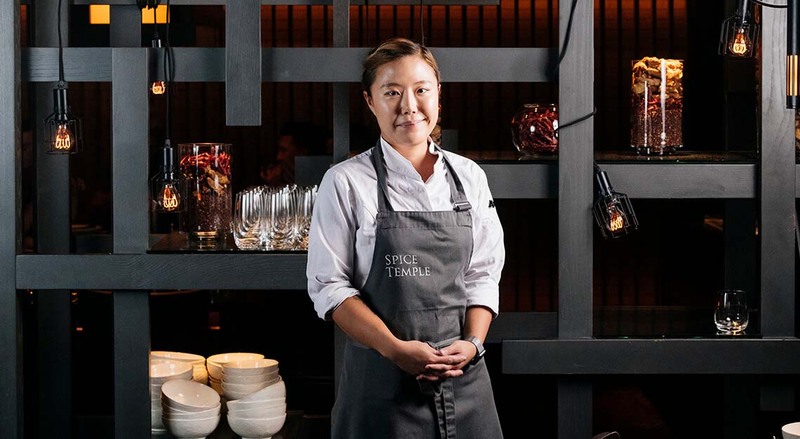 Not only does the 27-year old Korean chef successfully keep busy tables turning at Spice Temple Melbourne, but she climbed the culinary ladder to become the restaurant’s Head Chef in February 2019 after 12 months as Junior Sous Chef. Neisha arrived in Australia seven years ago and spent two years studying at Le Cordon Bleu. Her father was instrumental in her decision to become a chef. Both parents were teachers and her mum worked late each evening, leaving a gap to be filled when it came to the preparation of dinner. Neisha’s culinary journey at Rockpool Dining Group began when she joined Rockpool 1989 in 2014 as Chef de Partie. The determined 20-year old walked into the restaurant with her resume one day and was subsequently given a trial. “After the first day, I was really convinced that this was ‘the place’,” she says. However, the following year she decided to move to Melbourne and was thrilled to secure a role as Chef de Partie at Spice Temple Melbourne. Neisha loves the authenticity of the food at Spice Temple and nominates the restaurant’s stir-fried prawns with salted duck egg and four chillies as her favourite dish. “The harmony of four kinds of chillies gives a nice kick, then the salted duck yolk makes the sauce creamy and mellows out the heat and perfectly balances the dish. The sauce makes you want to order more rice,” she explains. Her favourite cocktail is the Dragon. “It’s light and refreshing: gin and lime with an in-house lemongrass soda and a rose water spritz to finish. I like that it takes inspiration from Asian ingredients, and it matches really well with the lighter dishes on the menu,” she says. Do you want to follow in footsteps of Neisha? Click here to check out jobs at Rockpool Dining Group today!